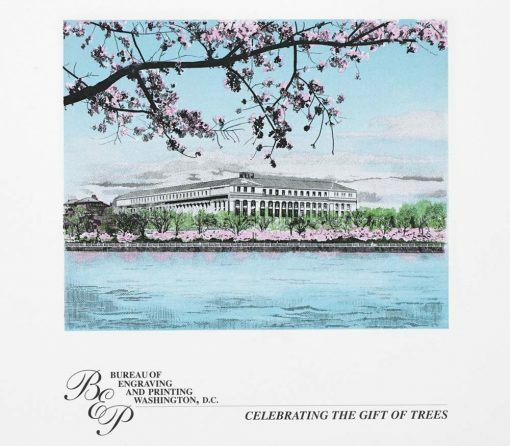 Earlier this week, on Wednesday, March 20, the Bureau of Engraving and Printing (BEP) started selling its Cherry Blossom Engraved Print. The print’s release coincided with the opening day of the National Cherry Blossom Festival — an annual spring celebration in Washington, DC, commemorating the March 1912 gift of 3,000 Japanese cherry trees from the Mayor of Tokyo to the city. Priced at $9.95 and measuring 8" x 10", the print depicts some of the iconic cherry blossoms along the Tidal Basin in Washington, DC, with the BEP’s headquarters building in the background. For those visiting the area, Cherry blossoms are expected to reach their peak bloom from April 3 to 6. While the Bureau of Engraving and Printing makes and sells detailed intaglio prints and engravings, it is best known for producing United States currency. The bureau prints billions of Federal Reserve Notes each year for delivery to the Federal Reserve System. These notes are produced at facilities in Washington, DC, and Fort Worth, TX.